Christopher Gabbitas began his musical training aged 8 as a boy chorister at the ancient cathedral in Rochester, UK, continuing studies in voice, piano, violin and organ as a music scholar at Uppingham School and being awarded a Choral Scholarship to St John's College, Cambridge University in 1997. He took a Bachelor's and Master's degree in Law before moving to Christ Church College, Oxford University as a Lay Clerk, completing further postgraduate studies in Law and subsequently qualifying as a Solicitor of the Supreme Court. 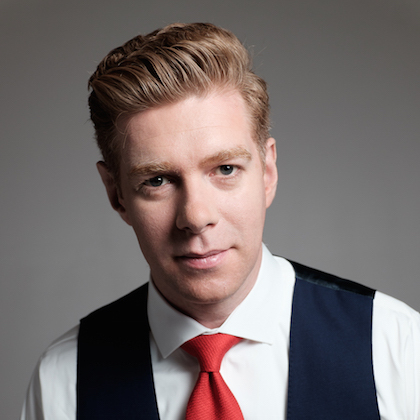 Whilst working as a lawyer in London, Christopher sang with many of the UK's finest choral ensembles including Polyphony, The English Concert, The King's Consort and the Choir of the Temple Church, and under such conductors as Sir Simon Rattle, Stephen Layton and Trevor Pinnock. The wide variety of repertoire sung by these various ensembles, from the music of the Renaissance to contemporary commissions, was the perfect learning experience for later musical endeavors. In particular, during this time Christopher was privileged to work closely with composers Sir John Tavener (on his epic "The Veil of The Temple"), Sir Richard Rodney Bennett, Thomas Ades and John Rutter, amongst others, on recordings and live performance projects. In 2004 he was appointed to The King's Singers, touring for 15 years, recording in excess of 30 albums and performing almost 2,000 concerts in many of the world's finest concert halls, churches and cathedrals. Recognition for the group during this time included two Grammy Awards and an induction into the inaugural Gramophone Hall of Fame. Whilst with The King's Singers, Christopher taught as a visiting clinician at over 500 masterclasses and summer school sessions, helping to shape choirs across the world. In 2018 Christopher announced his resignation from the group in order to focus on choral direction and education. In 2019 he will take up the post of Artist Professor at the University of Redlands, teaching a bespoke Master of Vocal Chamber Music degree that will combine choral ensemble singing with the study of essential business skills required by all professional musicians.